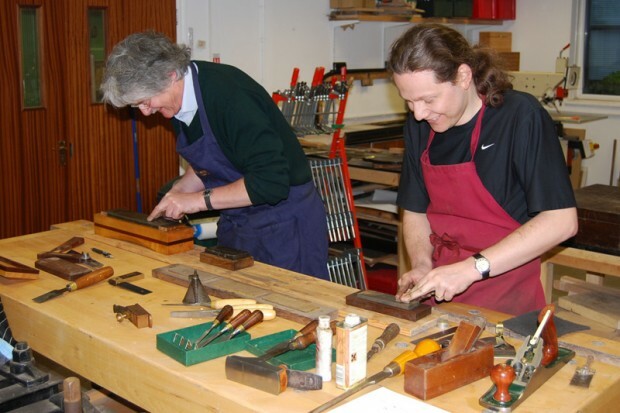 If you want to learn about marquetry, cabinetmaking or restoration for any reason then the Marquetry Centre is for you. Whether you are a beginner or a qualified maker, whether woodworking is a career or a hobby, Yannick Chastang offers a course for you. 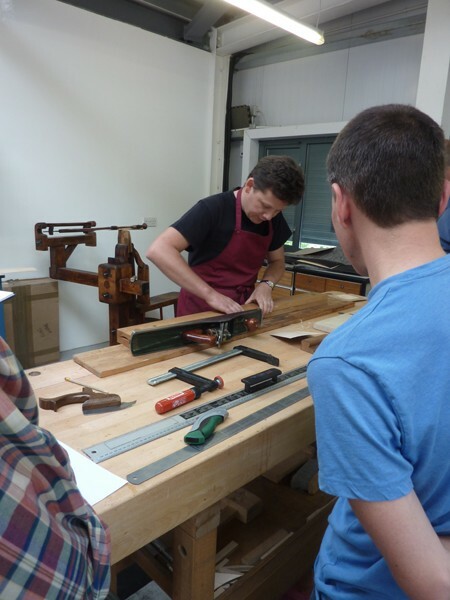 This is a chance to acquire knowledge from generations of cabinet-makers and restorers, handed down by tutors at Ecole Boulle and by master craftsmen from around the world. Yannick’s unique insight, gained through his experience of working on the best antiques in the world and the most exclusive modern marquetry and furniture projects for decorators, designers and private collectors, makes studying with him an incomparable experience. Everyone who meets Yannick comments on his breadth of knowledge and the wide range of experiences he can draw on. 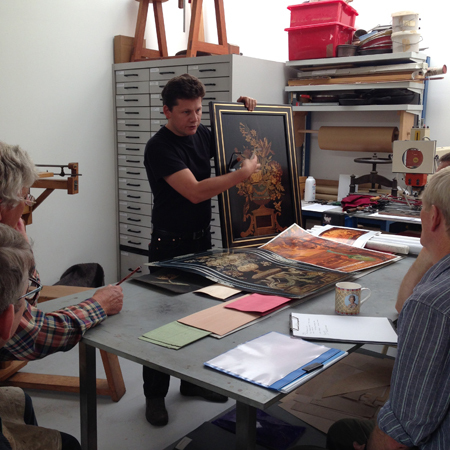 A typical marquetry course with Yannick can also encompass an impromptu wax finishing lesson or lead to a discussion on modern laminating. There are no boundaries to Yannick’s courses: questions asked, questions answered. I learned such a lot even in the couple of days I was able to take part…. Can’t wait to try some of the techniques back in my workshop. Thank you very much for a great 5 days. For me the course far exceeded me expectations and your enthusiasm to share as much knowledge as possible was just what I was after. You were very generous with your time and expertise. So during the 5 days I was with you covered quite a few topics not strictly part of a “marquetry donkey course.” The digressions into all aspects of marquetry were for me what made your course special. I was enlightened by your course! Shame I did not start 30 years ago!! Thank you very much indeed for these last five days. 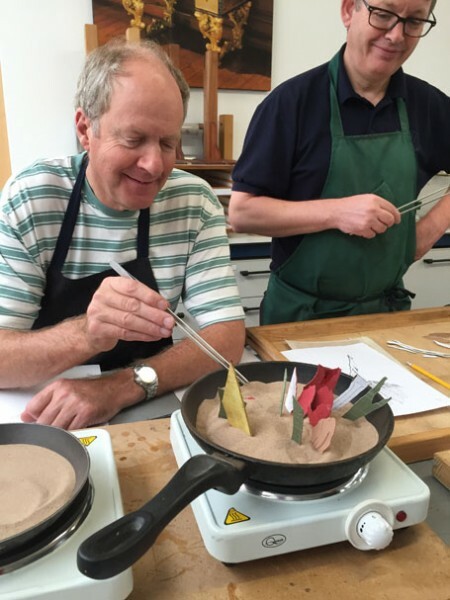 The course was excellent – it was a privilege to have an insight into your world. Your enthusiasm and energy were evident all along. I was impressed by the attention to detail. Yannick started researching the ancient arts of marquetry more than twenty years ago, through reading ancient texts and while conserving priceless museum pieces of furniture. The now widely redistributed 18th century handbook by A.J. Roubo, L’Art du Menuisier is not unfamiliar to Yannick who has been using it for over twenty years. Yannick’s fluency in French and English enables him to read such primary texts, avoiding the modern translation errors that are all too common in such technical treatises. The practice and understanding of ancient techniques is not only useful for preserving the “craft’, it can also offer many viable and simple options for the modern maker. Yannick Chastang believes that an accomplished maker should make use of all the techniques available to him, from traditional to the most modern. All too often, in our search for modern technologies, we have lost sight of the simplest ways of achieving a goal. It is not always logical to use CNC or laser cut marquetry to make a one-off artistic piece. Yannick’s courses will help you realize your potential and will teach you to use your best and most reliable tool: your own hands. Yannick has taught and lectured all over the world on the art of making fine furniture, gilt bronze and conservation and, in particular, on traditional marquetry techniques. His experience in teaching is considerable, including being a visiting teacher at West Dean College and at the Institut National du Patrimoine (Paris), providing a short course in New York for the American Institute for Conservation, and he is a regular contributor to courses at Christie’s Education and Sotheby’s Institute. Yannick was trained by Pierre Ramond, the master marqueteur and author of many books, and is one of the last traditionally trained marqueteurs in the world. Yannick’s own book on the history of marquetry furniture is the second bestselling book on marquetry and traditional marquetry techniques (after Ramond’s). “During my work advising international collectors on furniture, both in my twenty-five years at Sotheby’s and buying for clients in the subsequent years, I have had a growing admiration for the skills of the restorer/conservator. Having met Yannick Chastang in 1998 when he was at the Wallace Collection, he has greatly helped my understanding of the demands of cabinet making and conservation work and has worked on many important pieces that I have bought for clients over the years. These courses provide an opportunity to train with Yannick in his modern and spacious workshop in Kent. The techniques taught may be traditional but his clean and light-flooded premises are a long way from the traditional dark, dingy workshops of the past. 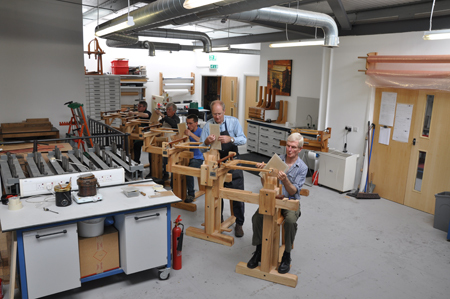 There is an extensive range of marquetry making equipment, as well as a workshop fully-equipped with safe modern machinery with air-conditioning and humidity control. There are different courses aimed at all levels and at everyone who wants to learn. Have a look at our programme of courses and do not hesitate to contact us if you would like something tailored to your needs.